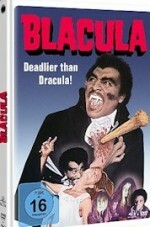 Two furniture collectors purchase the coffin of an African prince in the classic blaxploitation flick BLACULA, unaware that the body inside is a black incarnation of the famous vampire. This Soul Cinema collection includes the 1972 original as well as its follow-up, SCREAM, BLACULA, SCREAM, starring the inimitable Pam Grier. See individual titles for additional details.